Is Paving Suitable For Driveways? Home / News / Is Paving Suitable For Driveways? With so many paving choices on offer, it’s incredibly easy to find a style that’s ideal for your home, to achieve the exact look you were hoping for. From granite to limestone, sandstone to porcelain, there’s a vast variety of beautiful paving stones to achieve the ultimate outdoor style. We often have homeowners asking us about whether paving slabs can be used to create an attractive driveway. With it being such a common question put to us, we thought it best to create a post offering our advice for using paving on your driveway. You can create a stunning looking driveway through the use of paving stones or slabs, but there are some considerations you have to make to achieve the best result possible. Firstly, not all paving is suitable for using on a driveway. Thinner, more delicate paving won’t be able to withstand the weight and pressure of vehicles rolling across it on a daily basis, not to mention the constant weight when a car is parked up. With that in mind, it’s recommended that you opt for paving flags of at least 50mm thick. These flags will be stronger, sturdier and much more able to last many years as part of your driveway. The type of paving you choose to lay on your driveway is of very little importance if you don’t get the sub base right. Without a well laid sub base, your driveway will be much less durable and won’t be able to last you as long as you would hope, no matter what type of paving you use. 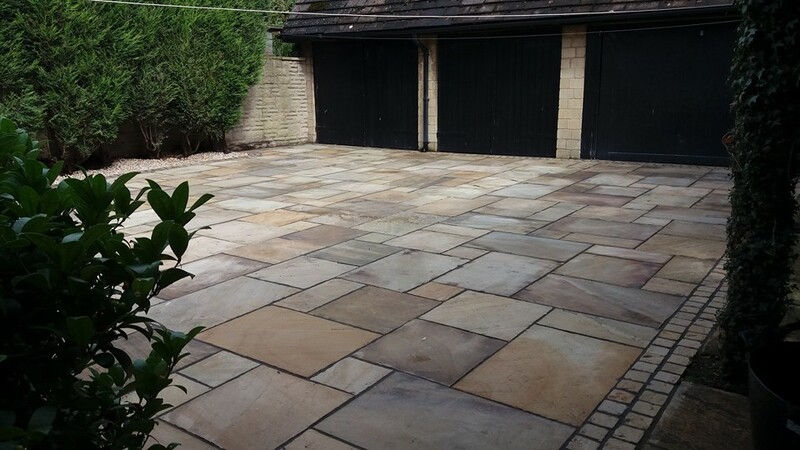 The right sub base paired with thick and solid paving flags will certainly provide a strong and aesthetically pleasing driveway. What makes a good sub base? The sub base layer is the most important component of a strong and long-lasting driveway. It’s this layer that will make sure your driveway can withstand the weight and pressure of vehicles and that your paving doesn’t bear the brunt of it. Domestic driveways for one of two cars typically require a sub base layer of at least 100mm, but aim for 150mm if possible. Many homeowners and professionals of the trade opt for a sub base called DT Type 1, which is made up of crushed rocks, large and small. Some of the rock in the mix will be up to 40mm large, whereas others will be ground down to dust. It’s this varied mix that allows the sub base to interlock when pressure is put on it, creating a strong support for your driveway. It also helps to the driveway to drain away any water that lands on it. It’s vital that your sub base is compacted using a roller and that it is laid in several thin layers to make up the recommended 150mm. This will ensure the very best levels of compaction and drainage, to prolong the life of your driveway. To answer the question we are frequently asked, you can use paving as part of your driveway, but you will find that plenty of research and consideration will go a long way to providing you with a strong and long-lasting driveway for your home. Take this information away, look into some of the best paving for a driveway and pay close attention to your sub base. In no time at all, you’ll have a beautiful driveway to be proud of for many years to come.